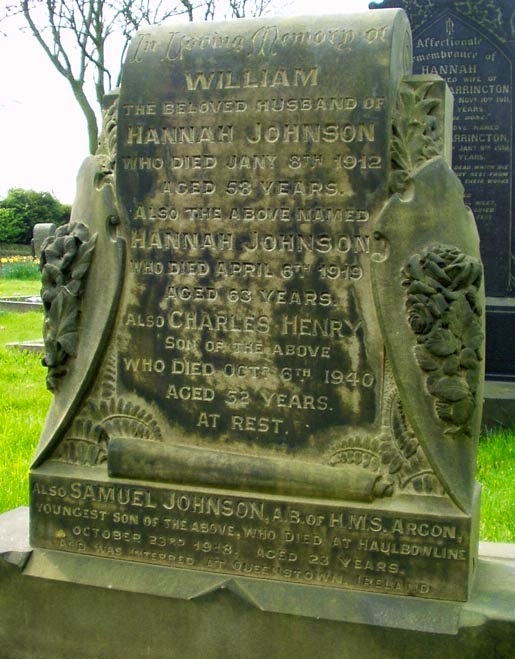 In Loving Memory of / William / the beloved husband of / Hannah Johnson / who died April 6th 1919 / aged 63 years / also Charles Henry / son of the above / who died Octr 6th 1940 / aged 52 years / at rest / Also Samuel Johnson, A.B. of H.M.S. Argon / youngest son of the above, who died at Haulbowline / October 23rd 1918, aged 23 years / and was interred at Queenstone, Ireland. Samuel is also remembered on the Carlton War Memorial, St John's Church and is buried in Ireland.